While visiting Brunk, we filmed a 4-min. video displaying some of the technology and business philosophies. That theme clearly clicks with customers, as the growth of the company and the investments it’s made become obvious when touring its expanding operations. Vertical integration has Brunk Industries, Lake Geneva, WI, acquiring new precision laser welding workcenters and stainless steel passivation lines, among other capital investments. And, of course, there’s the new showpiece at the company’s home: a 60,000-sq.-ft. facility, in addition to the original 80,000-sq.-ft. operation, that houses a pair of high-speed mechanical and two servo presses, all brand-new coil-fed Minster models from Nidec Press & Automation. Today, the firm employs a startling 72 toolmakers, with Brunk calling the skill set “our differentiator in the market, helping us earn customers. Our toolmakers are the heart of our business. We visit local schools, and focus on recruiting young people from the region. Then we provide continuous training and a well-developed apprenticeship program, started in the 1960s. We currently have six apprentices going through our Toolmaker apprenticeship program. In addition, we also have Press Operator & Setup as well as CNC apprenticeship programs. 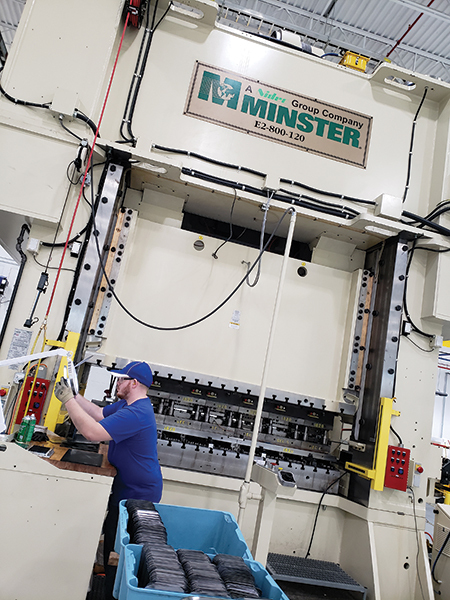 The new building at Brunk stars this 800-ton Minster mechanical press, brought in initially to stamp a stainless steel part previously machined. Here, the press stamps a stainless steel water-tank component, now made in a single progressive die with 1500 punches. Previously, the part was stamped in several stages of five to 10 punches. To help make the part in one die, Brunk stepped the punches to reduce press force from 700 to 380 tons. In its original 80,000-sq.-ft. building, Brunk offers low- to high-volume precision stamping on a variety of presses from 5 to 400 tons, stamping material as thin as 0.002 in. It also houses an area dedicated and outfitted for rapid prototyping and product development. Some 80 percent of the company’s work fills medical-industry orders, including critical implantable devices and surgical instruments. When coining, or when performing similar operations where the workpiece material compresses into a plastic state and flows into cavities, the operation generally benefits if the tool remains closed longer than when the job runs on a traditional crank-motion press. Hence, the advantage of using Brunk’s new 180-ton servo press—slowing down when the ram nears 180 deg. assists with that material flow, and has aided Brunk in developing other tranformation projects. All of the new presses at Brunk carry new Vamco feeds. Brunk managers selected the feeds for their ease of setup, speed and accuracy. In addition to the 800-ton press, equipped with a Vamco feeder (sheet capacity to 0.25 in. thick by 31 in. wide), Brunk’s new building, opened in December 2017, houses the above-mentioned 180-ton-capacity Minster Model P2H-FX-160 servo press (6-in. stroke, 33.5 by 74-in. bed), equipped with a Vamco feeder (sheet capacity to 0.25 in. thick by 21.5 in. wide). We spied the press stamping another converted machined part, this one a stainless steel surgical instrument. 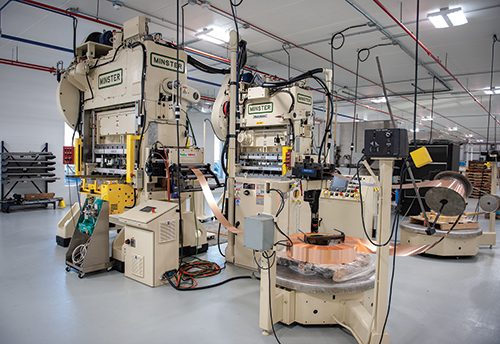 And, nearby, one of the firm’s two new 100-ton Minster P2-series high-speed Piece-Maker presses (also equipped with a Vamco feed) was stamping copper-alloy sheet to make drug-dispenser components. Along with laser welding, other processes brought inhouse via recent capex programs include stainless steel passivation and electro polishing. Both processes prove critical to the success of medical-device (and other) applications, to ensure, in the case of electropolishing, minimal surface roughness and contamination, and optimum surface uniformity. Passivation merely restores the anti-corrosion properties of the stainless steel after stamping, welding and other processing. Reassuring customers that supply-chain interruption will not occur also derives from the company’s “smart-die” technology—a deep and long-standing commitment to in-die sensing that Brunk toolmakers view, explains Adams, from three distinct perspectives: die protection, process monitoring and part validation. “We see tooling, and smart-die technology, as part of our intellectual property,” says Steve Labutski, automation manager. “We combine it with Minster’s waveform technology and our Wintriss SmartPac and ShopFloorConnect equipment to validate each stamping process we develop, and then save that process parameter set to ensure reproducibility.